Despite Pope Francis’ overwhelming popularity, only about one-in-ten American Catholics say they turn to the pope “a great deal” for guidance on difficult moral questions, according to a Pew Research Center survey on religion in everyday life. Rather, most Catholics say they look inward for guidance in their lives. 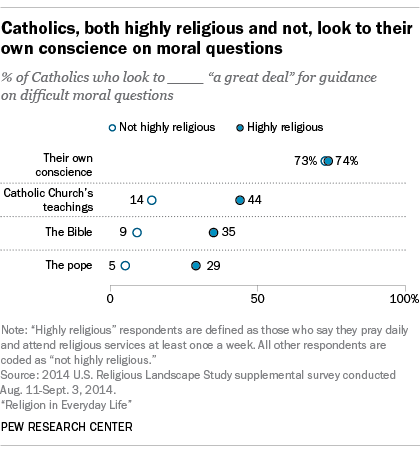 Roughly three-quarters of U.S. Catholics (73%) say they rely “a great deal” on their own conscience when facing difficult moral problems, compared with 21% who look to the Catholic Church’s teachings, 15% who turn to the Bible and 11% who say they rely a great deal on the pope. Perhaps not surprisingly, Catholics who are highly religious (defined in our survey as those who say they pray daily and attend religious services at least once a week) are considerably more likely than other Catholics to seek guidance from church teachings, the Bible and the pope. Still, no more than half of highly religious Catholics give great weight to any of these sources of guidance, while 74% say they rely a great deal on their conscience. Relying on one’s own conscience doesn’t necessarily indicate a conflict with church teachings. In fact, the Catechism of the Catholic Church emphasizes that “a well-formed conscience is upright and truthful” and that “[t]he education of the conscience is a lifelong task.” According to the Catechism, the “Word of God” (i.e., the Bible) and the “authoritative teaching of the Church” should guide the formation and education of the conscience. And Pope Francis’ recent proclamation, “Amoris Laetitia,” makes several references to the importance of Catholics’ individual consciences in issues related to family life. As a result, Catholics may not see the four response options in this survey as entirely distinct. It is possible they may not look directly to the Bible, the pope or the Catholic Church’s teachings when making difficult moral choices, but they may be guided by these sources indirectly through their own “well-formed” conscience. Like Americans as a whole, Catholics say they are most likely to rely on themselves when making big decisions. Indeed, about eight-in-ten U.S. Catholics (84%) say they depend “a lot” on their own research in the decision-making process. Advice from family was the second most popular choice among Catholics, with half saying they rely a lot on relatives. Fewer Catholics say they rely a lot on prayer or personal reflection (39%) or advice from professional experts (30%). And only one-in-ten say they rely a lot on advice from religious leaders (10%) when making major life decisions.